Born in 1922, in Frankfurt, Germany, Raymond fled the Nazi regime when she was 16 years old. She settled in Manhattan, where she became part of the bohemian Greenwich Village art scene, taking various jobs as an artist's model, waitress, and tennis pro. She came to find her poetic vision when she studied with the legendary photographer and fine art printer David Vestal at the Photo League. She began exhibiting her work at various galleries in the 1970s, eventually moving to the Hudson Valley later in life. Raymond's work can be found in the collections of the Museum of Modern Art, the Metropolitan, and the Victorian and Albert Museum, among others. She received a Vision Award from the Center for Photography at Woodstock in 2008. In one of Lilo Raymond's most beautiful photographs, two pillows have been placed, one on top of the other, before a simple mirror and upon a white dresser. A window on the left, framed by filmy curtains, lets in the light. Everything is suffused with whiteness, everything except the black knobs of the dresser's top drawers and the gray ceiling, as it is reflected in the mirror. It is morning; a house is being cleaned, a bed is being made. The moment of the photographs is ordinary, but it possesses an extreme, uncharacteristic purity. The pillows, which are temporarily out of place, look nevertheless as if the belong on the dresser, as if they have a life apart from their utility. This other life is what Lilo Raymond's photographs celebrate. Again and again, in the midst of plain, domestic settings, transformations occur, transformations in which ordinary objects seem suddenly invested with an aesthetic destiny. In another photograph the pillows reappear, this time slightly overlapping on a recently slept-in bed. They convey the look of sleeper or, more probably, lovers. The top sheet, with the sweep of its crumpled folds, is like the sea breaking on an abandoned beach. The photograph is elegiac. The lovers are gone, but they are memorialized by the casual, suggestive disposition of the pillows. 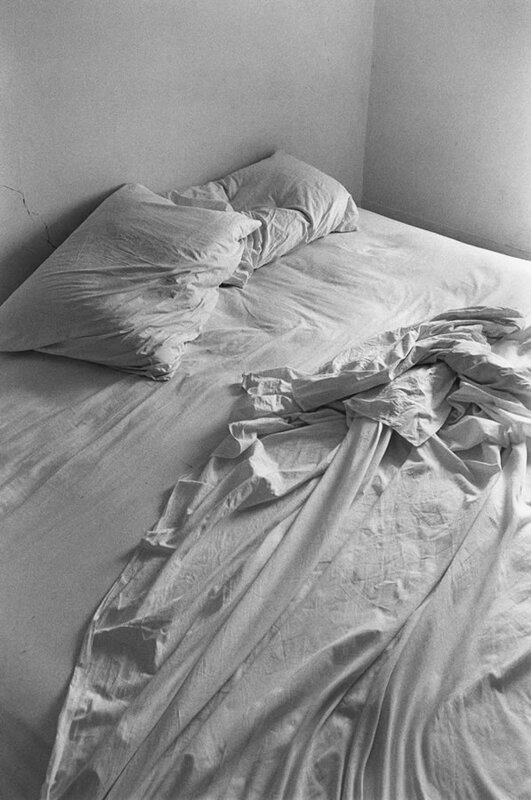 These photographs of pillows and sheets, in their simplicity, in their highly nuanced distribution of whites and grays, are intensely atmospheric, and in their frail, understand linear boundaries they manifest a graphic certainty, which they share with other Lilo Raymond photographs. Light does not call attention to objects in her photographs so much as objects provide surfaces over which and upon which light performs. And whether it is the revealing light of morning, where the beached illusions of night are encountered, or the cleansing light of noon, which shines upon the neat authority of an isolated utensil or upon the fastidious arrangement of fruit on a table, it is always limpid. Lilo Raymond's classicizing leads her to reject all but what is necessary in establishing memorable equations of beauty and simplicity. The rooms she photographs are bright alternatives to our overcrowded interiors. And they seem to call into question whatever surrounds us - from our own simple belongings to the oppressive waste of our society's urban clusters. In her photograph of paper shopping bags sitting lightly on a bare floor, she appears to be mocking our compulsion to acquire. The bags are empty of everything but the one thing worth having: the fresh, restorative light that leaves a curtain-filtered emblem of itself on the wall behind them. It is important to remember that in the reduced but ideal harmonies of Lilo Raymond's vision, light also means weightlessness; and it is that sense of weightlessness, along with light's availability, the moves us. In fact it is possible to view Lilo Raymond's photographs as manifesting a spiritual substitute for our culture of accumulation. By filling space, we diminish it; by letting it be, we support a condition in which we can be free. Lilo Raymond chides our shortsightedness. Her airy rooms suggest that beauty can lead an effortless existence and that a transcending elegance can flourish within the mortal precincts of the home.